Florida Trail, Clearwater Lake to Alexander Springs | Florida Hikes! The oldest section of the Florida Trail is one of the prettiest, as well. First blazed in the Ocala National Forest in 1966 by a hardy crew of trail maintainers led by Jim Kern, the Florida Trail between Clearwater Lake Recreation Area and Alexander Springs Recreation Area traverses beautiful, moderately hilly stretches of longleaf pine forest with an open understory, meanders around wet prairies and through hydric hammocks, and slips through a bit of scrubby flatwoods en route to one of the largest springs in Central Florida. There have been break-ins and vandalism of cars at this trailhead. This is one of the few Florida Trail trailheads in the Ocala National Forest that is within walking distance of a small community, and we’ve witnessed trash dumping and other vandalism in the forest as well. If you’re backpacking, get someone to drop you off here or leave your car inside the gates of the Clearwater Lake campground, 0.5 mile farther up the entrance road (fee). Day hikers tend to have less trouble than backpackers. Clearwater Lake: From the junction of SR 42 and SR 19 in Altoona, north of Mount Dora, drive east on SR 42 towards Paisley. After 6.4 miles, you’ll see the entrance to the Clearwater Lake Recreation Area on your left. Turn left and drive up the park entrance road. The first left turn is the trailhead parking area. Alexander Springs: From SR 40 east of Astor, turn south on CR 445A and follow the signs. After 0.4 mile, turn left on CR 445 and continue south into the Ocala National Forest for 5.7 miles to the recreation area entrance on the right, just after the bridge over Alexander Run. From the south, follow SR 19 north past Altoona until you encounter the turnoff for CR 445 on the right. Turn right and continue several miles up to the park entrance on the left. There is a $5 per person fee for parking at Alexander Springs. If you’re not planning to spend time at Alexander Springs Recreation Area – which is well worth the visit for swimming, snorkeling, paddling, camping, and the interpretive Timucuan Trail, one of my favorites in Florida – park off the side of the road at the road crossing along SR 445 and don’t take the blue blaze to Alexander Springs. It’s an extra half mile of hiking. Start your hike by following the orange blazes north from the kiosk at the Clearwater Lake trailhead. Passing a turnoff for the Paisley Woods Bicycle Trail, the Florida Trail continues due north before arcing to the east through a series of undulating mounds. Are they natural, or diggings placed here, perhaps, when the recreation area was built? There’s no way to know, as the forest swarms across them, but they do make for interesting hiking terrain. Rising up out of a deep bowl, the trail is in the heart of the classic Florida longleaf pine habitat you’ll be hiking through for the next couple of hours, with pines that rise like columns to the sky and a slight roll to the landscape, as if ancient creeks once flowed through the forest. In spring and fall, colorful wildflowers, including deer’s-tongue and lupine, peep through the haze of wiregrass on the forest floor. Passing another bowl of forest with cabbage palms peering out of a sinkhole to the left, the trail works its way across the sandhills to its former route, crossing an equestrian trail. Undulating terrain makes the hiking both interesting and challenging. Although there are separate trails for bicyclists, equestrians, and ATVs throughout the forest, you may encounter them on the drier sections of the trail. The trail skirts numerous flatwoods ponds and small prairies fringed with saw palmetto. At 2.7 miles, you pass a nice dry camping spot under the pines before the trail enters a series of open wet praries and the floodplain forest drainage of Alexander Run. Here, a series of boardwalks carry you through the swampy hydric hammocks, where cabbage palms and giant leather ferns evoke a prehistoric feel. You cross two hard-packed clay forest roads, FR 69-4.8, after you emerge from the hydric hammocks. After 10 miles, you reach the turnoff to Alexander Springs. The 0.5-mile (each way) blue blazed trail leads to your last reliable water source for the next 4.9 miles. Although there is a fee for using the Alexander Springs Recreation Area, it’s a great place to take a break. The cool, clear spring gushes forth a river, and you can rent a canoe and take a float trip downstream. Camp at the recreation area for a fee, or enjoy the facilities for the day – the swimming and snorkeling is great, and there’s a small camp store with food on site – and head back down the trail for a free campsite. If you prefer to skip Alexander Springs, you’ll reach the road crossing at CR 445 (a paved road) after 11 miles. It’s only 10 miles between these two points but yes, random camping is allowed and you can certainly hammock in this forest. Plenty of trees and open understory. Enjoy! Thanks a bunch. I love this site it has been so helpful in getting started backpacking. We will be hiking there and back again with a day at the spring in between. On Jan. 5, 2019, I hiked to Alexander Springs and back with a friend – 20 miles in roughly 7 hours with a 15 minute break at the 10 mile turnaround point. I turn 50 at the end of the month and hiking the 74 mile portion of the Florida Trail through the Ocala National Forest is my gift to myself this year!! What we didn’t know was that it was the last weekend for hunting season and despite the fact that hunters were everywhere, we felt safe with our brightly colored clothes. Saw 3 deer and Benjamin Brewer’s grave! Perfect weather, beautiful day, awesome hike. The last boardwalk before Alexander Springs was extremely slippery from mold and the fact that there was no mesh on top to help with traction. Other than lots of hunters, we only came across 4 other people during the first 11 miles. During our last mile, we saw 3 different large groups of people. It was quite the undertaking — my feet were swollen and hips sore but we lived to tell about it with enthusiasm and pride!! 45,000 steps on my FitBit that hike! There is not an established camping area but if you find a flat spot, random camping is permitted. Thanks Sandra. Based on your experience, I see on the topo that around mile 6 north of Cleaarwater, the FST meets some sort of water body there known as Glenn Branch. Is that a clear, flat close to the water appropriate camp area? As I recall, it’s a palm hammock and not suitable for camping. Somewhat swampy. If you are just hiking the FL Trail, Alexander Springs only charges $6/day to leave your car. Greetings, I am an ADK46r and AT sectional hiker. I moved to Ponte Vedra about 2 years ago and started hiking again. Having grown-up in South Florida, before moving to Upstate NY, I became very familiar with Florida’s environment (spent a lot of time in the Everglades during my youth). The mid-sections of the AT are time consuming travel wise in order for me to reach the necessary trail heads. Thus, Ocala National Forest is very desirable for me to keep my trail legs since it’s in my “backyard” and easy to drive to. I bought your book and enjoyed perusing it very much. I would like to start my 1st hike in ONF from Clearwater northward to Juniper Springs. I don’t mind paying for overnight parking as long as my vehicle is safe from vandalism. Where do you recommend overnight parking at Clearwater and at Juniper Springs (we might bring two vehicles and leave one at each end as an option)? Thank you for your time concerning this matter. In both cases, it’s safest to park inside the recreation area, behind the gates. There is a nightly fee to do so, and they’ll direct you where to park. Keep in mind that hunting seasons are ramping up throughout Florida, so check the FWC website regards what’s going on in Ocala. Always wear bright orange shirt or vest when hiking during hunting season. Hiya! I’m planning a solo trip down to the forest next week (4/6) and had my eye on this hike, however I’d hoped to not have to do it out and back. Are there any resources for ride sharing, Uber, anything where I could hope to have help dropping a car at one location and getting a ride to the start of the hike? Much appreciated! Any suggestions for other hikes that are robust (10-12 miles) but are loops? Arranging a shuttle in the Ocala National Forest is always tricky and seasonal. We know of a few volunteers who do so and we list their contact info in The Florida Trail Guide but they wouldn’t be comfortable being identified on our website. There is a nice 6.5 mile loop you can do from the SR 19 trailhead up and around Buck Lake, or start it at Alexander Springs to stretch to 12.5 (the loop portion is only about 2.5 around the lake). Loop hike options are on our website here. Will be doing this section of the FT this weekend and cannot wait!! Great information here, also just bought your book at REI. Will bring along with me for use on the trail. Thanks for all the hard work y’all do! Enjoy and thanks for picking up the book! That’s a beautiful section of trail, but be aware that if you plan to overnight along it, it is very close to the town of Paisley. Plan to camp at Alexander Springs or to the north of it, and away from any forest roads. Is there a place that is dry enough to set up camp somewhere along half way on this trail segment? As a Florida native who has backpacked southern Florida my entire life, I really appreciate the information and advice throughout this site. I have never hiked the FT north of Kissimmee. Are there any restrictions or permits required for camping along the FT through the ONF? 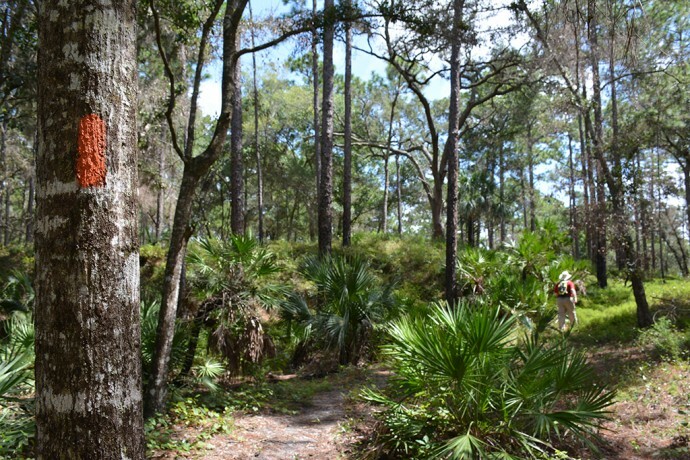 See the sidebar of our page at https://floridahikes.com/ocala for those details. Thanks! i was hoping to buy a hiking guide that was exclusively for the Ocala Forest and closely surrounding areas. Is there such a guide? We haven’t done one but we’ve talked about it! Here are ALL of the trails in the Ocala National Forest. We also have a book called Five Star Trails Gainesville & Ocala that has many of the trails there plus many more around both Ocala and Gainesville.